Every Tuesday I share travel tips here on the blog. This week I want to share with you a tip for passing time while waiting to board your flight. Last week as I was heading to my gate to work a flight as a flight attendant, I saw a mom who had a great idea for keeping her kids (two boys, around ages 6 and 8) occupied while they waited for their flight to board. 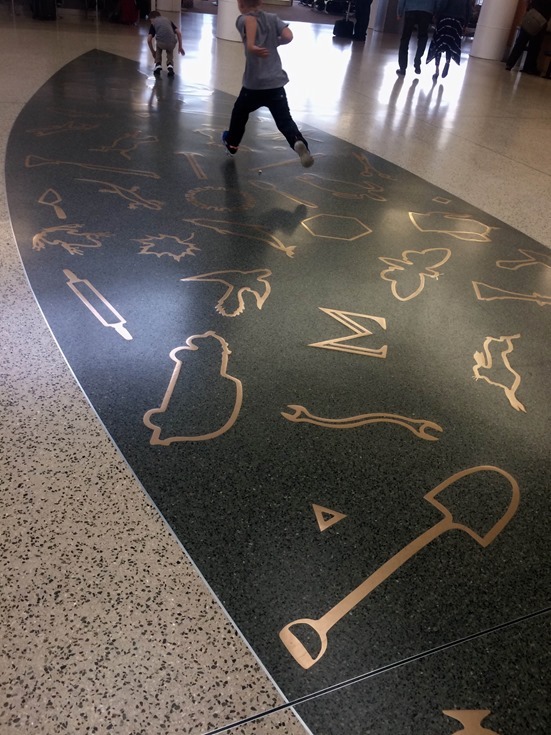 We were in Seattle and there was a great floor mural with nature symbols in it. The mom was calling out shapes for the boys to find, and the boys would find the symbol and run over to step on it. After the boys found all the symbols, Mom started calling out a series of 2-4 symbols for them to find in order. I was impressed! The boys had no clue that this was somewhat educational. They were having a great time trying to beat each other in finding the symbols. 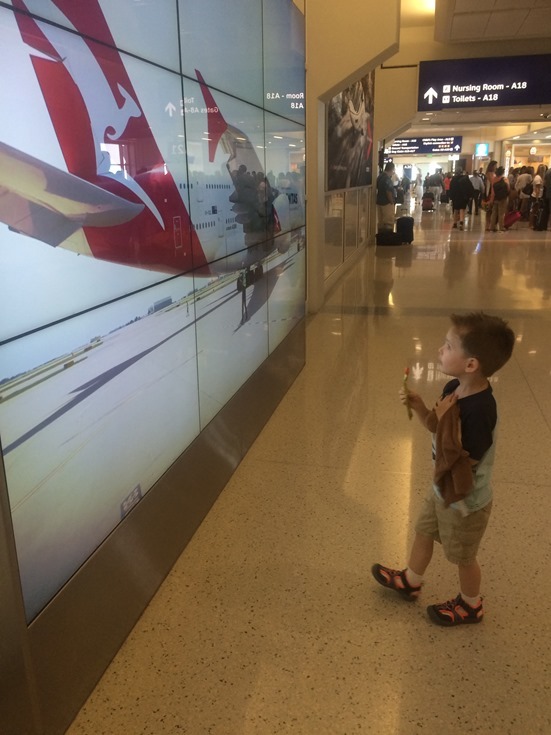 What a smart way to pass the time while saving toys and electronics for the flight! Last time I flew with my 3-year-old son, John, he hunted for all the “EXIT” signs. We were at the DFW Airport, where all the “EXIT” signs are green. Since John’s favorite color is green and one of the few letters he knows well is ‘X’, he was excited to pick out all the green exit signs as we walked through the terminal. Like the boys with the floor mural, John had no idea he was practicing pre-reading skills while finding all of the “EXIT” signs. He had a blast! Here’s a picture of John finding familiar letters within an advertisement as we made our way through the terminal. Here is another floor mural, this one at the DFW Airport. It was in a busy hallway, so I couldn’t play the “find a shape” game here, but John did enjoy observing the design and of course felt the need to walk the circle. We love airport art! 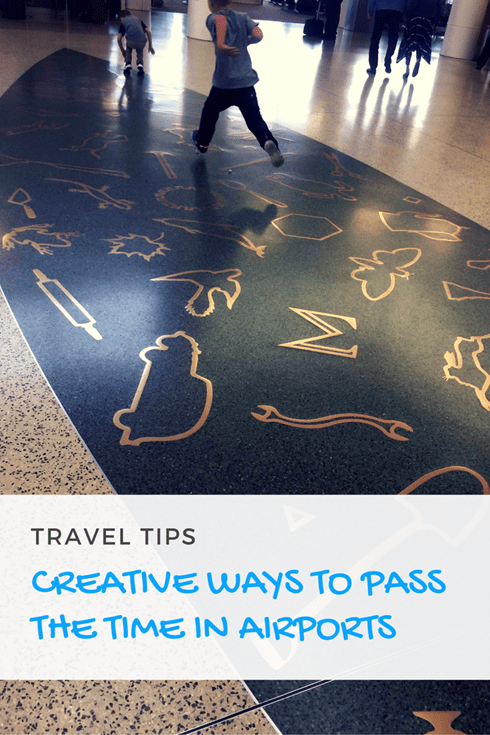 While you might not have the luck of having something as cool as a floor mural to work with next time you fly, you can play “I Spy” with colors, letters, shapes, and more using signs, luggage, and people around you. Next time you’re at the airport give this a try and come back to let us know how it went! Do you have good ideas for ways to pass the time while waiting to board your flight? Share them with us in the comments below or on our Facebook, Twitter, or Instagram pages!